How the wielding of power and public morality evolved over the centuries? Ever since the time of Socrates, Plato and Aristotle, then in Rome under Cicero(106-43 BC) the Roman Republic and its institutions evolved up to the French Revolution and to the modern day Constitutions, in democracies and authoritarian regimes, the abuse of power and the curtailment of citizen freedoms, we live through uncertain times. Some thoughts and reflections. We, Indians, inherit what political Legacy? Or, public morals and conduct? These questions arise when we look at the way us, as a nation and people, live and thrive. Is there a hidden hand that is ‘manipulating’ the agencies to delay for so long in some of the sensitive cases, legal cases involving big money and also big people, that is, the high and mighty? This was in reference to some high profile alleged corruption cases that involve the top politicians and their kinds. It is a scenario that gives rise to some of the most troubling questions for the public life in India. Fortunately, or unfortunately, the world today is also witnessing some of the most challenging issues in world peace and political instabilities. In the USA we see Donald Trump taking some steps that are almost all against the conventions of governance.USA is taken by the rest of the world as a model democracy, a republican government with Senate and Congress and the parties and the whole exercise of power on almost on the lines of ancient Rome. But the America today is also faced with some of the most uncivilised outcomes. The rising gun violence fails our imagination of a modern and prosperous society. Such heartless brutalities against innocence children? The President, given his peculiarities of character etc. is also proving helpless. Given the credit where it is due, Trump also shows enormous surprises, he is, for example willing to meet and speak with the North Korean dictator! The world is suddenly relieved. There is a heaving sigh of relief. At the same time, there is also the phenomenon of the opposite trend in the other two bigger democracies, or regimes that are both authoritarian and almost dictatorships. In Russia we see Vladimir Putin seeking office after being in power for 17 years. What sort of political regime it is. Also, in China, Presdient Xi votes, himself casts his vote ,also the 3,000 member of the National Congress, Parliament, that legitimatise XI continuing in power after the expiry of his two -term convention dran by Deng. What is the sort of politics we, as people at large in India and outside, practice after the world learnt to practise democracy as established in Athens? It was Plato, later Aristotle, who gave us the idea of a Constitution for political governance. Plato was present at the trial of Socrates and soon after Socrates was put to death in BC 399, Plato left Athens and he travelled to Syracuse where, we know, he drew a Constitution for the “Tyrant”, Dinosius. We in India live by a political Constitution drawn by eminent brains since 1951. How do we live up to the our Constitution that had withstood the past 70 odd years? The present regime seems to be doing not badly. But when it comes to some niceties, we seem to be lacking in some vision. We operate a democratic constitution. The basic aim of the Constitution is to ensure the freedoms of the citizens, equality of everyone before the law and we, for all practical purposes run a government by rule of law. Our laws are derived from the principles of Roman Law. Our democracy is a Greek inspiration and also what we have learnt from the British Constitution and the British Constitutional conventions. These we derive again from what we learn from the British rule. Is our freedom of the press real and alive? Yes and no! There is freedom but there is widespread fear in the minds of citizens. The press is not throwing up uncomfortable questions. There is lot of blackout, right? Our Prasar Bharati and DD and Radio are a sham, right? Our judiciary independent or handicapped. Just today I read something like 400 and odd vacancies in the High Courts! What does this fact convey? Why so many are languishing in jails without bail? Why still the delays in appointment of judges? Here comes the pertinent question asked by the SC on the ‘hidden hand manipulating the delays in such cases like 2G scam? Are there not enough talent in the judiciary and the bar? It is here I thought of other histories, the life and works of the ancient Greek thinkers, the Romans. Figures like Cicero (106-43 BC) who was and remains to this day, the greatest jury, the greatest orator in the Roman Forum courts and also the Senate in the same premises. You can see the monuments, the earth on which Cicero walked if you walk through the Roman Forum (as we did some time ago). Cicero, whose writing, speeches, letters and other pieces are the greatest monuments of Latin literature and forms the foundations of education in the Western tradition. Others wrote in Latin, Cicero writes Roman, observed Cardinal Newman. Fredrick the Great, that incomparable king in that un enlighted age called or claimed infatuation ‘for Cicero! Edward Gibbon, Macaulay and Samuel Johnson…there are no limit to great men and great mind who were not infatuated by Cicero’s wise thoughts. Others on the continent, in France, Diderot and Voltaire! Voltaire declared, ‘Cicero taught us to think’. Between 1465 and the end of the century 200 editions were printed of Cicero writings, the first Greek works in Greek type , other very many firsts in Cicero’s writings in the later fifteenth century. 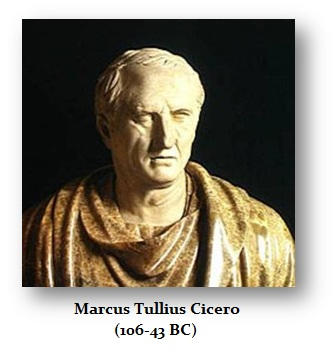 Cicero became the founder of the Western classical education tradition. Let us at least become aware of this history. We have to learn and learn to adhere to the basic tenets of good governance. No individual, however great or powerful can last for long. It is wisdom to become aware of this reality, both the ground reality and also historic flow of events that unless men learn to conduct themselves with self-restraint, mass upsurges, revolutions, why even violence and terrorism becomes our day to day reality.